This coming February I will have been practicing chiropractic in San Diego for 20 years. It seems like an eye blink of dragging in the portable table the first night before the paint was dry to treat a girl who had fallen off of a balcony and landed head first on her head. A million adjustments (not an exaggeration) of everything from movie stars, to cleaning ladies, sandy surfers, and women about to give birth, old people so frail their bones could barely hold them up, down to newborn babies the day after they were born. Getting to be the second chiropractor in the world to teach M.D.’s in a medical school (U.C. San Diego), training over 1000 chiropractors, slowly paying off a gigantic chiropractic student loan, watching staff members arrive, grow up, and sometimes move on. We have seen patients get married, have babies, and very, very rarely leave this earth. There are a 100 professions where I could have made more money, and worked a lot less, but none that I could be so proud of all the people we have helped, and all of the love they have given us. A great friend of mine, a chiropractor named David Singer, once said to me, “When I lie on my death bed, I want to know, that I helped more people, in more ways, than anyone thought was possible. That is how I feel. And I’m just getting started being a San Diego Chiropractor, even after 20 years. 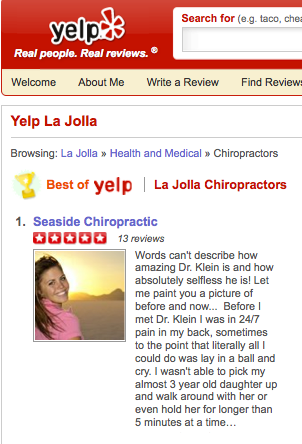 We were recently awarded “Best of Yelp” which I am very proud of. I will definitely mention this page to people I know who are in need of more chiropractic services. I share your sentiments and I know how you feel being a practicing chiro for 2 decades. Keep it up! Such a rewarding profession to be in. I’ve been a chiropractor for almost 10 years, and I love it.